The vanilla and saffron infused honey served at Cinnamah-Brosia’s Coffee Cottage may have caught your attention. You learned in the fun facts from The Essence of Courage that saffron is the most expensive spice in the world, but did you know that vanilla is made from the seed pod of an orchid? Visiting The Earthy Delights Recipe Blog you’ll discover a history and science lesson on saffron and vanilla and how they are interconnected in nature. 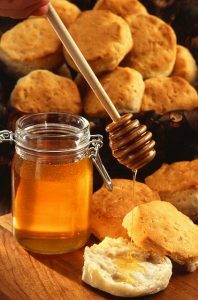 These precious spices combine well with honey to create a tasty drizzling for your favorite biscuit recipe. The combination makes an excellent gift. 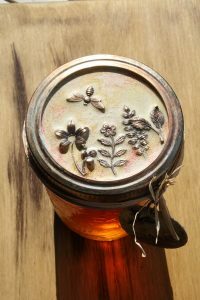 We love the beautiful diy lids perfect for this infused honey to make a really special gift presentation. You’ll find the instructions for these at Vintaj. Photo is from Vintaj.